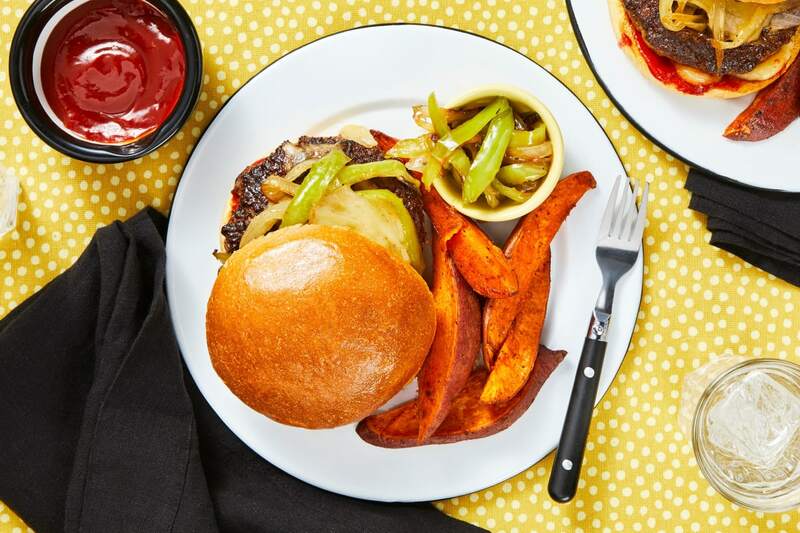 This burger that stacks up against the best, literally: each bun holds a beef patty that’s been smothered in melted pepper jack cheese AND sautéed peppers and onions. 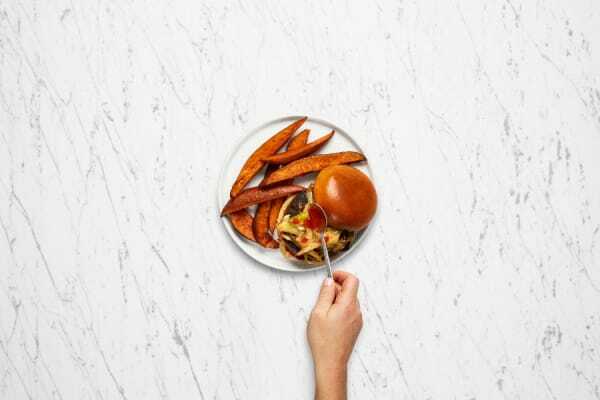 Just in case that doesn’t make this burger a front-runner for first-place, let’s introduce the secret weapon: a special spicy ketchup with hot sauce that you can add to taste. If you aren’t blown away yet, you will be when you’re holding this bad boy in your hands. Adjust rack to top position, then preheat oven to 425 degrees. Wash and dry all produce. 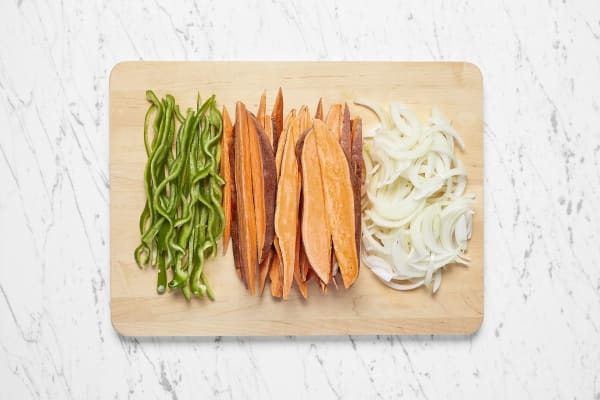 Cut sweet potatoes into ½-inch-thick wedges. Halve, peel, and thinly slice onion. Core, deseed, and thinly slice green pepper. In a small bowl, combine ketchup and hot sauce (to taste). 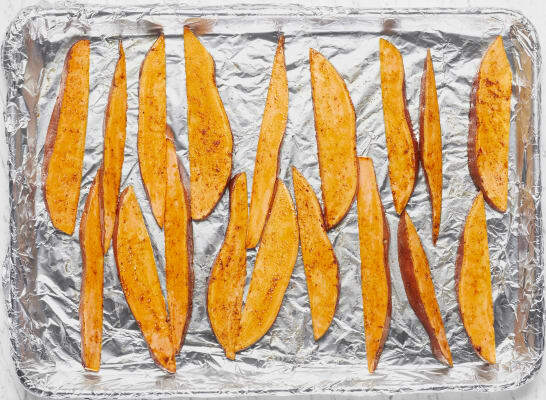 Toss sweet potatoes on a baking sheet with a large drizzle of oil, salt, pepper, and half the BBQ seasoning. Bake on top rack, flipping once, until browned and tender, 20-25 minutes. Meanwhile, heat a drizzle of oil in a large pan over medium-high heat. 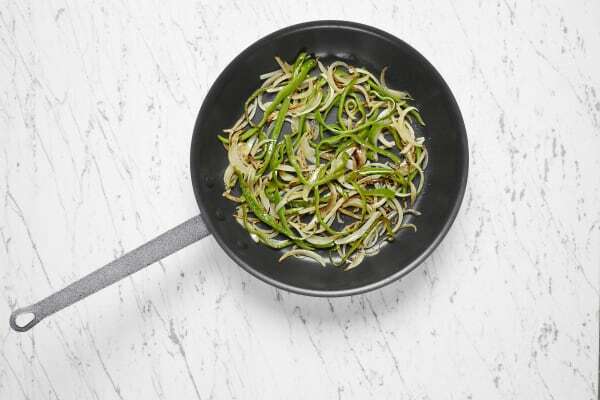 Add onion and green pepper and cook, stirring, until browned and softened, 7-9 minutes. Season with salt and pepper. Turn off heat; remove from pan and set aside. Wipe out pan. In a large bowl, combine beef, remaining BBQ seasoning, and a large pinch of salt and pepper. Divide mixture in half. Flatten each piece into a wide, roughly ½-inch-thick round. Set aside half the cheese. Divide remaining cheese between the center of each round. 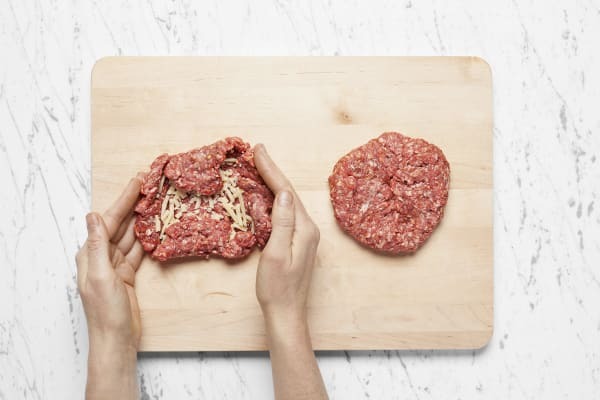 Fold edges of meat around cheese, shaping and sealing to create cheese-stuffed patties. Season all over with salt and pepper. Heat a large drizzle of oil in same pan over medium-high heat. 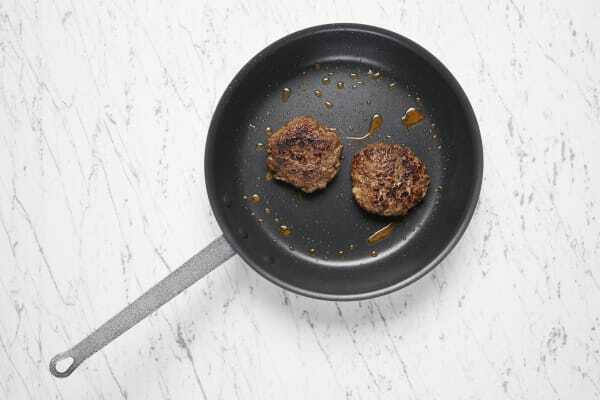 Cook patties to desired doneness, 3-5 minutes per side. Carefully top each patty with a layer of onion and pepper (you may have extra), then top with remaining cheese. Cover pan until cheese melts, about 1 minute. While burgers cook, halve buns and place on another baking sheet. Toast in oven until golden brown, 2-3 minutes. Spread cut sides of buns with spicy ketchup. Top bun bottoms with smothered patties. Drizzle with any remaining hot sauce if desired. Serve with sweet potatoes (and any remaining onion and pepper) on the side.